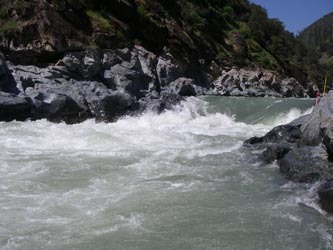 Technical and difficult, the rapids on the North Fork create a thrilling and action-packed day. Chamberlain Falls Gorge starts things off with a rapid-fire succession of whitewater: Slaughter’s Sluice, Zig Zag, Achille’s Heel, and Chamberlain Falls’ seven foot drop. The rapids continue with Bogus Thunder, Staircase and several other fun Class III and IV rapids. The Chamberlain section is a boofing paradise, and a great training ground since many of the rapids can be made more difficult with alternate lines. The second half of the day has class II and III rapids like Nose Stand and Double Dip. The North Fork of the American River canyon is a place of beauty: steep cliffs, clear green water, and a lush riparian environment. Waterfalls and rushing sidecreeks are also common during the spring season. The high walls of the North Fork canyon support Black Oaks, native pines, and many species of foothill birds. Despite a relatively short run, a day on “Chambies” feels like a wilderness experience because of the canyon’s isolation and high, steep walls. The North Fork American is a popular after-work kayak run in the springtime. Folks head to the Chamberlain Falls section from Sacramento, Auburn, Coloma, and Truckee to get in some weekday paddling.